depending on the setting in Options.. (Tabs). The contents default to the current setting for same - see Default new tab folder option. The new tab automatically receives the focus (ie. becomes the active tab). 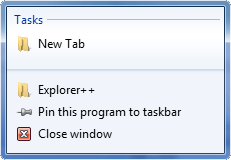 The above methods, unless stated otherwise, open the tab with the contents of the folder used, not the default contents or Default new tab folder (see above).